The valley of the New River and the New River Gorge serve as the dual focus for this highland of farm, forest, and town. The region is one of the chief outdoor-recreation destinations in West Virginia and home to several of the nation’s largest outdoor-adventure resorts. Thousands of acres of forest are protected by the New River Gorge National River, the Bechtel Summit National Scouting Reserve, and many other parks and preserves. The center of the New River Gorge Region is near the center of our New River Gorge Region map. The region extends from Summersville, in the north, to Hinton, in the south. The term “New River Gorge Region” was only applied in the last decades of the 20th century after the New River Gorge, in Fayette County, was recognized as a cultural and economic resource. 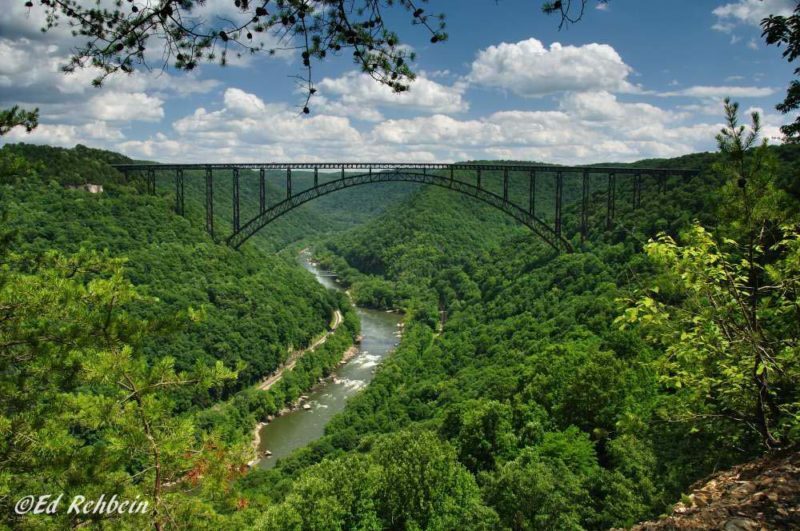 Until then, and before construction of the famed New River Gorge Bridge, the area was defined as part of southern West Virginia. Concurrent with the construction of the bridge, the National Park Service established and began to develop the New River Gorge National River, which included part of the gorge, in its north extent, and the narrow valley of the river to the south. The creation of the national river further popularized the gorge though it extended its reach conceptually and erroneously far to the south along the valley. As a result, the region also began to include the highland regions around the New River far to the south, including much of Fayette County as well as Raleigh County and part of Summers County. It also came to include Nicholas County, to the north of the gorge, which shares an area of similar terrain, including gorge and tableland, and national parkland around the Gauley River National Recreation Area.